The retina is the delicate film in the back of the eye that absorbs light, converting it into electrical signals that eventually create the images our brain sees. The sensitivity of the retina is designed to allow us to see in variable lighting conditions, from nighttime to a bright sunny day. It is not designed to look at extremely bright objects. If someone gazes for any period of time at such objects, including the sun or an eclipse, this will create a tiny burn in the center of the macula (the part of the retina we use for our straight ahead central vision). This is similar to burning a hole in a leaf by focusing sunlight on it with a magnifying glass. Direct sun gazing can occur in children, sunbathers, as part of certain religious rituals, in schizophrenics, or in those under the influence of hallucinogenic drugs. Immediately following the event, patients develop a central blind spot with decreased vision. How is solar retinopathy diagnosed? The diagnosis is made with a dilated retinal examination. 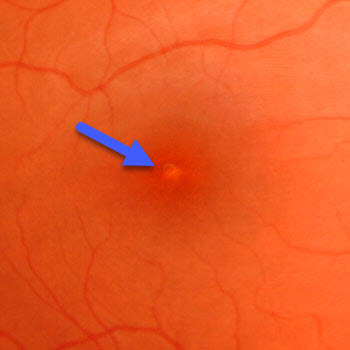 Immediately following the light exposure, a small central macular yellow spot is found in each eye. This spot will soon fade leaving a tiny central macular scar which will be present for life. 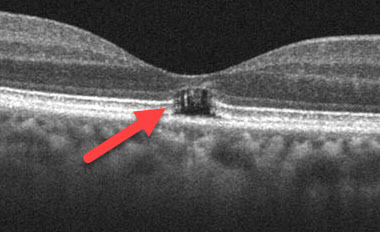 OCT scanning confirms the diagnosis by showing a small central loss of macular tissue. How is solar retinopathy treated? Remarkably most patients recover fairly good vision with no treatment although some can be left with permanent central blind spots. Patients need to be counseled against repeating the sun gazing behavior.